The investment Weheartbeat has made in local culture has afforded many fans the opportunity to watch international artists in spaces they never imagined possible, while local musicians and DJs have shared these platforms with their idols. In celebration of these incomparable experiences and achievements over the last 7 years, Weheartbeat is set to present one of their most exciting events thus far. While the official anniversary falls on 31 May 2019, the celebrations will be spread across multiple venues over 3 days from 30 May to 2 June 2019. The event series will combine live music, design, exhibitions and workshops in line with Weheartbeat’s passion for the union of creative energy. Drawing focus on the harmony between music, design and community the main event will take place at Arts on Main to present a night market that will feature a dedicated photography exhibition curated by Hannah Faith and a Weheartbeat photographic and video installation by Riley Grant. Each space occupied throughout the event series will reflect the passion, commitment and investment made by Weheartbeat within this music community and will serve as a celebration of the collective's incredible contribution. 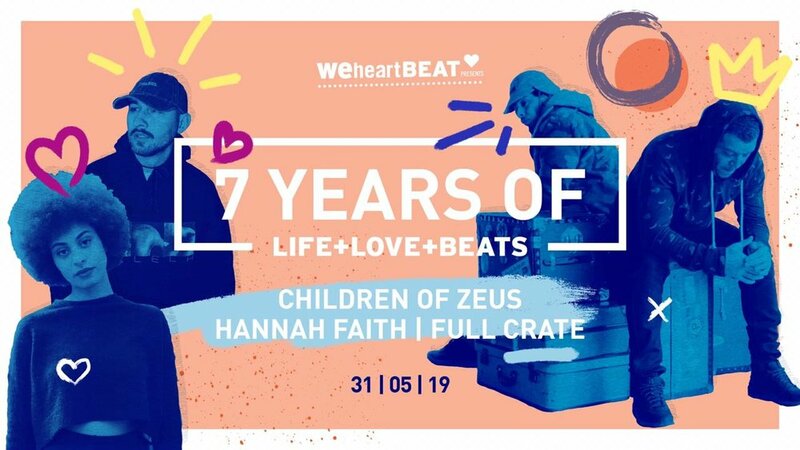 Join Weheartbeat as they celebrate the milestone that is 7 Years of Life + Love + Beats . . .